The site began the day I learned that the hedge fund where I had worked for 3 years as a full time analyst and consultant was shutting down. The hedge fund was interested in my work based on a prior blog which had made several fantastic market calls from 2007 onward, including the top and pending bear market. I’ve made as impressive calls the last three years - just see the Featured posts section. But I’ve decided to change course with this site, and move to Twitter only. That is where the action is anyway, along with StockTwits (TBD if time to do both). So please keep up with @pivotalmomentum, or feel free to send a note through the contact page while it is still up for a limited time. Whoever you are, hope my work has kept you on the right side of the market. Thanks for reading. Q3 ends with SPX facing resistance at QR1, DJI at YR1 and RUT at YR2. NDX jumped above YR2. Yesterday even though my usual signals were all bearish I didn’t fully trust it because of the FOMC day pattern. That was the right idea, as indexes tried to rally today. But - NDX jumped above YR2 which is huge. The door is open for selling tomorrow on the weaker indexes, meaning NYA, DJI and RUT. However, I don’t think Friday will do too much damage. The real message of the market’s response to these levels is likely 10/1. In addition, safe haven strength with TLT launch from HS1. These are the kind of days that can kick off significant moves. Especially when you consider that 3 of 5 USA mains are testing yearlies (NDX YR2 and RUT YR2, DJI YR1) along with VIX YP. Yet somehow I am not as bearish as I perhaps should be. Ordinarily this kind of action would call for major risk reduction / hedge. Were there any positives? But really it is this - I’ve seen enough rallies into FOMC 2:00 pm, down after the announcement, and recovery the next day. So maybe I am viewing all this bearish action that took place 2:30 - 4 with a bit of suspicion. Let’s be clear, I am only partially long. But I’m not pounding table bearish as I ordinarily would be given all 5 USA main index bearish action and VIX confirmation. Hopefully this is the correct assessment. For now watching NQ after hours to see if it can rally above its new DP. If we see follow through to this bearish action on Thursday then that will indeed be concerning. All 5 USA mains and VIX below. 3 yearly levels testing - NDX YR2, DJI YR1 and VIX YP. So far no definitive move. Let’s give it another day. Every weekend I do my full analysis and for the most part these have been pretty good. When I don’t know and markets are mixed I am clear about that, but when I am looking for a setup then I have thought that through very carefully. Due to YR2 rejection and pending MP break I came into the week already short NDX. I did not expect today’s move to happen with QQQ managing to close above the MP. So I am heeding this message of the market and thinking buyers will be stepping in near the end of Q4 anticipating another leg up. So far DJI is holding above its MP, but VIX is pretty much bang on YP. VXX could have rallied today but didn’t. Bottom line - 3 yearly levels in play and there isn’t a clear move yet. But today’s lack of bearish follow through on NDX is a definite point for the bulls. PS: Bonds are falling off a cliff. 9/11 selling on both ZB and ZN below all pivots has been the definitive move. If markets were that concerned about a trade war these probably will be steady. Ball is will the risk on bulls. I will change my tune of DJI don’t hold above the YR1 and we see further NDX YR2 rejection, along with VIX YP clear. DJI, NDX and VIX below. So far bullish for SPX to clear QR1, but ES is right on the level and SPY below. As usual more on the blog this weekend. Win for the bulls as DJI has cleared its YR1. 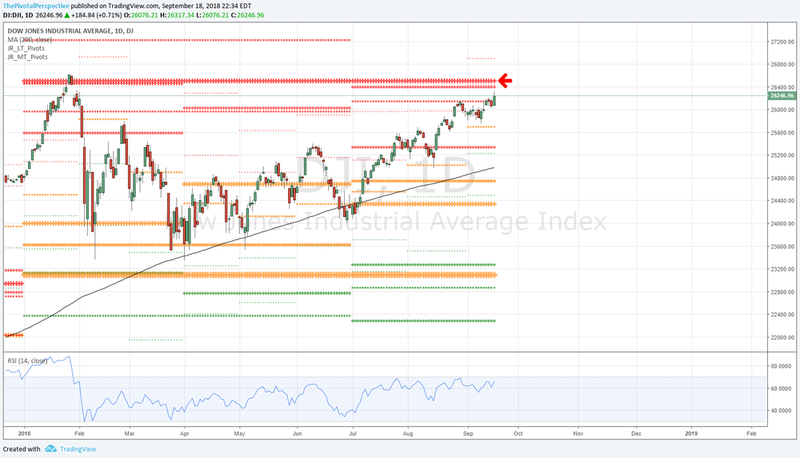 Coming into the week I didn’t think this would happen so easily, but as the market responded from the low early in the week recent comments have been hinting that this breakout looked more possible. NDX is still testing YR2. 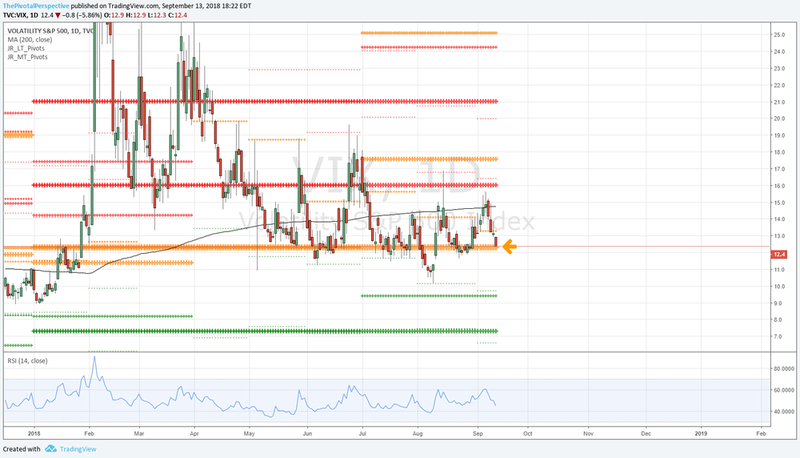 VIX is below YP but fractionally, and a move back above would be easy to occur. SPX is slightly above QR1. RUT got in gear with a move back above its MP, and also a launch from YR2 which held as support. In sum most action bullish, and with all 5 USA mains above all pivots I must give the trend the benefit of the doubt. That said action looks a bit toppy, and an option expiration week with an end of month fade wouldn’t be unusual. Also, from the Total market view timing section, 9/20-21 turn date. These have been rocking lately, and a dedicated post on the blog will follow. 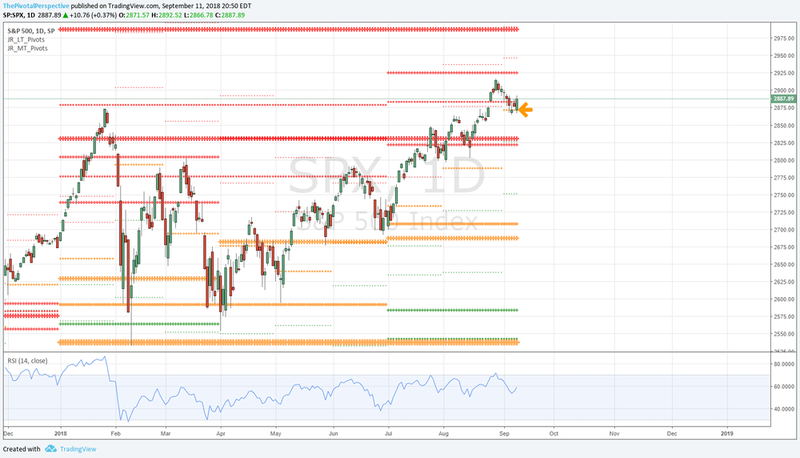 Based on my analysis in the Total market view, I came into this week prepared to make a defensive adjustment should enough signals trigger on Monday. They did, and locking in some gains in small caps and tech so far the right move. But the market came back faster than I thought, and with VIX moving back under the MP yesterday and already testing YP instead of launching, and with SPX, DJI and NYA above WPs - thought crucially not NDX and RUT - there was room to add some longs back. I had mentioned XLF as a maybe two weeks ago as something to watch given the move in rates, and thankfully I spotted that early enough to catch some. But the larger issue is that the market is an interesting place. 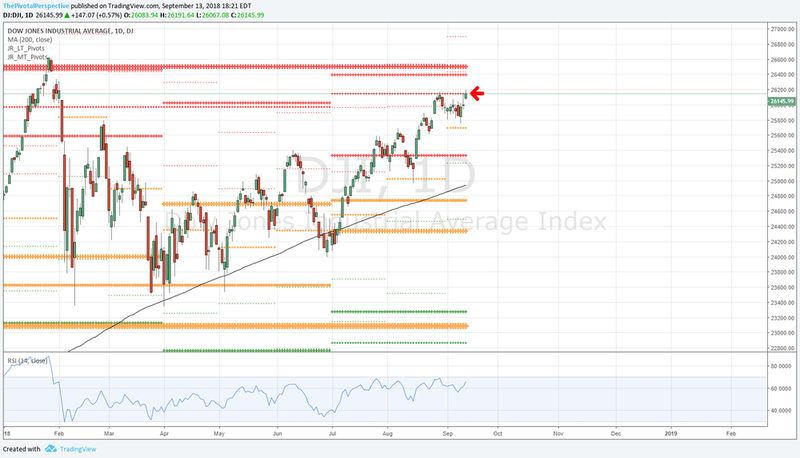 There are ingredients for a decent trading top in this area - DJI YR1, NDX YR2, VIX YP, along with other technicals, and breadth and new high / new low deterioration. But so far VIX pointing to bullish resolution; DJI approaching YR1 confidently which increases the chance of clear; and NDX also could have dropped more today but didn’t, and it seems a recapture of MP could happen tomorrow. If the market makes a small shakeout and then resumes higher we have to be open to that possibility as much as a trading top. For now I like the financials into quarter end as re-balancing is hitting the winners and helping the laggards. But I’m not playing the emerging indexes yet because virtually everything is still under long term pivots. A more bullish day than I expected, but NDX and RUT remained below their MPs. VIX, however, dropped back under its MP instead of launching further. Regardless, DJI - which often gives the best pivot tells on the market - is in a very important area. It cleared HR1 today but on the way to YR1. I think this level, along with NDX YR2, will define the next larger move in the market. If you were prepared to make a defensive adjustment coming into today based on certain signals, it was a good day. Nearly all of the bearish signals that I pointed out as possible in the latest Total market view happened today. Check, mostly check, check, check, check. But it is interesting that safe havens other than VIX could not rally on today’s news. Also, SPX & DJI were not hit nearly so hard as NDX and RUT which suggests an institutional re-balancing move and not just trade war fears. Being in cash when multiple USA mains are showing rejections of long term resistance, monthly pivot breaks and VIX confirmation is usually the right move. SPX, NDX, RUT and VIX below. Bulls still in charge, but things are getting interesting at the NDX YR2. As usual more on the blog this weekend. Two weeks ago I expected a pullback and got it. Then I thought SPX MP would hold and it has. Now what? These are the big levels in play. The easy bullish resolution would be NDX above YR2, DJI above HR1, RUT holding MP, and VIX below YP. But we have to consider the possibility that this may not happen. We’ll see tomorrow. All charts mentioned are below. That said, today an interesting day. NDX and RUT could have broken levels but didn’t. SPX and DJI look a bit toppy but held support. VIX closed under the MP. So I’m still cautious here but the market is for the bulls to take. Ah, the bounce that I’ve been expecting from SPX and RUT MPs finally happened today. But is everything in the clear? So ball is in bull’s court but both NDX and RUT ideally perk up a bit more, along with VIX moving below its MP, to be certain of a move back to highs or higher. The market is at an interesting point. Initially I thought NDX would not clear its YR2 on first try, then it did, but quickly failed. Now with any more rally it may test again. It is only because I have seen major market turns on yearly levels (2009 stock low, 2016 February low, 2016 bond yield low, etc etc etc) that I am paying attention to this one. Quarterly NDX RSI is above 90. If pros wanted to lighten up on tech this is exactly where they would do it. I was looking for a bounce from SPX and RUT MPs and got it, but have to say charts are not all great and bulls should pay attention. However, VXX did close fractionally below MP and that is a point for the bulls. Bottom line - I would like to see more of a bounce from this MP test on SPX and RUT. But as NDX has already broken its MP, perhaps it will test MS1. This is not a huge move in the scheme of things. Of more concern is the possible bearish move from multiple USA mains on long term resistance. This is only happening on NDX right now, but if others join in then that will be a problem. SPX managed to hold fractionally above its MP, but things are getting interesting with resistance at HR1. As usual more on the blog over the weekend! "Bottom line - Often DJI pivots give the definitive tells. The market just stopped at DJI HR1 so taking steps to lock in some gains, or play for a bit of downside while holding longs, should work or will have low cost at worst. 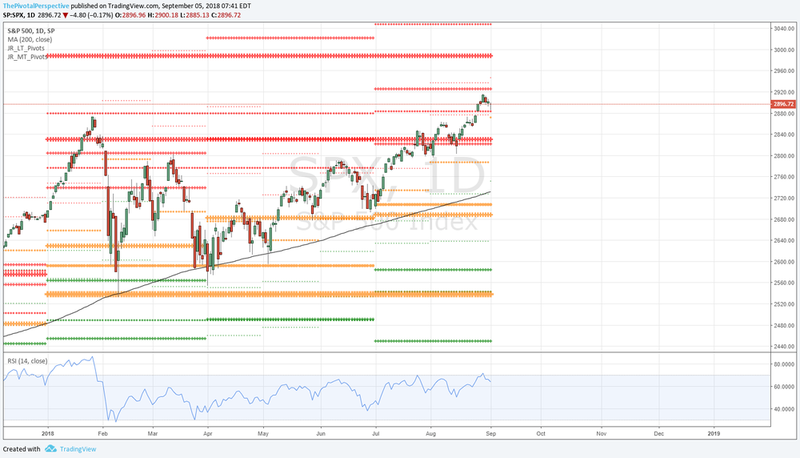 In addition, September is known for weakness followed by a strong Q4 especially in bull markets, so a strategy for near term weakness but likely higher highs seems to fit the market here." Lock in gains, playing for downside, near term weakness, all check, check, check. That said, this week has unfolded differently than planned. NDX, last week's technical leader, has dropped the most. What seemed to be ready to drop, DJI, has been steady. VIX / VXX have done OK, but not great, as a hedge. FXI short did work if you got in last week, but this just helped avoiding some, not all, losses on INDA longs. In sum a lot was right in last week's Total market view, but it would have been better just to take profits on longs instead of trying to hedge. So it is about even here with two of the -s fractional events that could easily change. If SPX and RUT can hold their MPs then that is still 4 of 5 USA mains above. But if they break, then it will be 3 of 5 below, inviting more near term weakness. Right now I think odds favor bounce Friday - but this is not a lock. SPX, RUT and VXX below. In August, two different holds of monthly pivots were key pullback lows. Today NDX, RUT and VXX all tested MPs. RUT and VXX both moved in favor of stock bulls, but NDX hasn't bounced yet. NDX also fell back under its YR2. I find level overshoots then fails are among the toughest patterns to deal with (harder than support breaks and recoveries, because it is somehow easier to expect this). So this monthly pivot will be important. If it fails, then it will start looking like YR2 rejection. SPX, NDX and RUT below. 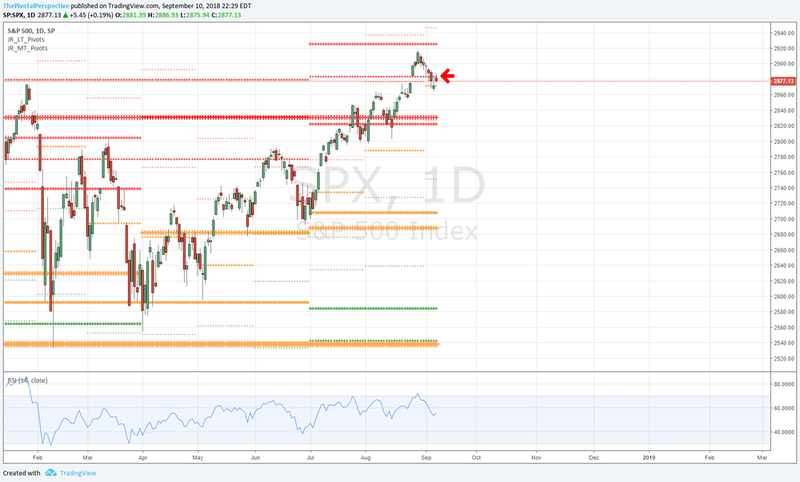 Some pullback as the latest Total market view anticipated, but USA indexes off the lows and quite resilient. 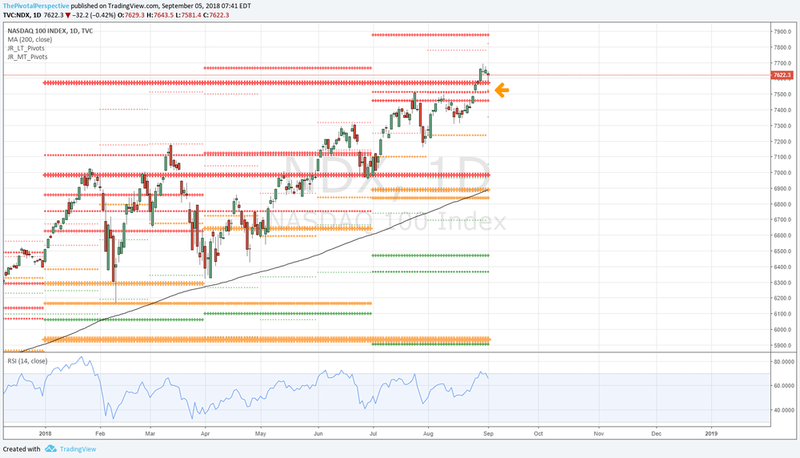 NDX near test of YR2 and holding so far. But 4 of 5 USA mains finished under WPs so tough to say that the low is definitely in. Also as expected international indexes leading lower with FXI EEM and KWEB dropping again from YPs. Others hit across the board including recent leader INDA. On the other hand, VIX finished under its MP so that is a point for the bulls. Bottom line is indexes may go lower but at this point expecting monthly pivots should they test to be a buy.